Celebrate #Fortnite1st with friends. Find birthday cake throughout the world and earn special cosmetics by completing challenges and quests in-game. Playground is back and better than before. Challenge your friends to a duel and build incredible structures on your own private island. Wield the new Legendary weapon in Battle Royale, the Compact SMG. The Save the World storyline continues in the Canny Valley campaign. 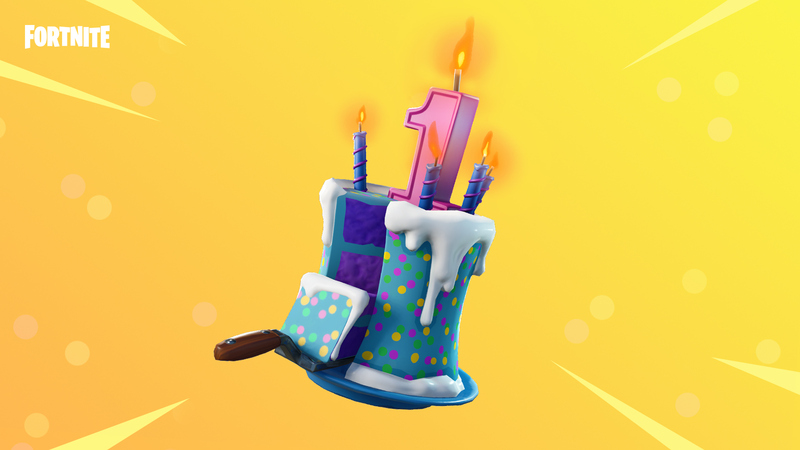 Get in-game and complete the Fortnite Birthday questline to unlock a special birthday reward! We’ve got a birthday party planned for #Fortnite1st and you’re invited! Eat cake, party and bring your friends. Each Birthday Challenge you complete unlocks a slice of the birthday cosmetic set. Playground mode is back on Wednesday, July 25! New team select options let you and your squad set up team battles for practice and training. Race! Create and share your screenshots and cinematics on social. Unwrap the newest weapon in Battle Royale. Engage in close quarters combat with the high capacity, fast firing Compact SMG.